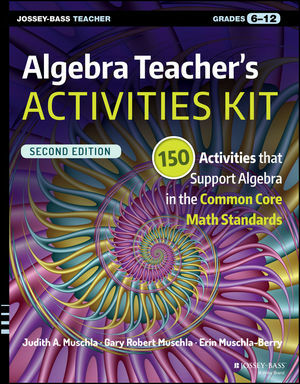 The Algebra Teacher's Activities Kit: 150 Activities That Support Algebra in the Common Core Math Standards helps you bring the standards into your algebra classroom with a range of engaging activities that reinforce fundamental algebra skills. This newly updated second edition is formatted for easy implementation, with teaching notes and answers followed by reproducibles for activities covering the algebra standards for grades 6 through 12. Coverage includes whole numbers, variables, equations, inequalities, graphing, polynomials, factoring, logarithmic functions, statistics, and more, and gives you the material you need to reach students of various abilities and learning styles. Many of these activities are self-correcting, adding interest for students and saving you time. Algebra lays the groundwork for every math class that comes after it, so it's crucial that students master the material and gain confidence in their abilities. The Algebra Teacher's Activities Kit helps you face the challenge, well-armed with effective activities that help students become successful in algebra class and beyond. Judith A. Muschla has taught mathematics in South River, New Jersey, for over twenty-five years. Along with teaching and writing, she has been a member of the state Standards Review Panel for the Mathematics Core Curriculum Content Standards in New Jersey. Gary Robert Muschla taught at Appleby School in Spotswood, New Jersey, for more than twenty-five years; his specialties include mathematics at the middle school level, reading, and writing. Judith and Gary have coauthored several successful math activity books, including Teaching the Common Core Math Standards with Hands on Activities, Grades 9-12, Hands-On Math Projects with Real Life Applications, The Math Teacher's Book of Lists, and Math Starters. Erin Muschla-Berry teaches 8th grade math at Monroe Township Middle School in Monroe, New Jersey, and has collaborated with Judith and Gary on eight previous math books.